A mantra is a simple phrase or sentence you can recite to yourself to improve your well-being. These mantras that are designed to help lift your spirits, heal your heart, and brighten your day as you navigate through all of life’s ups and downs. All of these mantras are written from the heart and are designed to help you shift your mindset, release stress, enhance your inner connection—and, in time, even change your life. You might find yourself letting go of past hurts; feeling brighter about your future; and discovering love, peace, and balance in your life. Try to recite the mantra daily for at least thirty days in order to experience the most benefits—however, you will probably start to experience the positive effects of reciting your mantra almost immediately. The mantras are designed to be simple and memorable so you can recite them with ease. For best results, recite your mantra slowly and try to put a lot of belief and feeling behind the words as you say them. If you take your time and allow yourself to really feel and believe what you are saying, the mantra will have a stronger impact on your life. For some mantras, it may take time before you can really believe or feel the power behind them, but with regular practice it will become much easier. In fact, the mantras that you struggle with or resist believing are the ones you probably need to work on the most! Even though each mantra comes with instructions, it is important to remember that there really are no rules. Use your own intuition to guide you, and work with your chosen mantra in whatever way feels right for you. You may also find it beneficial to keep a written copy of the mantra in an easy-to-read place, such as above your desk, in your car, or in the bathroom. This will serve as a great reminder for you to say your mantra regularly, which will allow it to really work its magic in your life. If you are ready to enhance your life, develop a deeper spiritual connection with yourself, and boost your feelings of positivity, My Pocket Mantras is just what you need. Today I feel energized and invigorated by life. How and when to recite this mantra: State this mantra three times aloud or silently to yourself while lightly jumping or jogging in one spot. The movement will boost your energy levels and instantly invigorate you. This is also a great mantra to recite during your morning workout. How this mantra can help you: Many of us need a boost of energy first thing in the morning. Instead of turning to copious amounts of coffee, try using this mantra instead. By chanting these words, you will feel inspired to tackle the day ahead and be motivated to accomplish whatever tasks need to be dealt with. Energizing your body with these words also grants you more stamina to get through the day and helps you to tackle head-on any issues that arise. This mantra is also great to use when you find yourself feeling bored or despondent about your life. At times we can all get stuck in a rut; it’s understandable. Reciting this mantra regularly will help you feel invigorated and passionate about life so that you can pursue all of your goals and dreams. In time, this mantra will also naturally boost your energy levels and help you to create a new zest and attitude for life. Today I will have faith and accept what is. How and when to recite this mantra: Recite this mantra three times either out loud or quietly to yourself as you get ready for the day ahead. How this mantra can help you: Many of us move through life with expectations. We expect things to go a certain way, we expect people to understand us, and we expect certain events or situations to unfold the way we anticipate. But imagine completely surrendering, allowing life to take you wherever it wants to go; imagine freeing yourself to embrace whatever comes, as if you chose it. Life rarely goes as expected, and this mantra is designed to help you find appreciation in that. It is a perfect mantra to use if you are feeling disappointed by recent events or if you want to remain open and free of judgments or expectations. Using this mantra, over time, helps you relax into the flow of your life, no matter how difficult or challenging things may get. Often when you release expectations and accept things just the way they are, life becomes a lot less stressful and far more enjoyable. This is not to say that you shouldn’t ever imagine the future, but sometimes getting too attached to ideas and outcomes can cause unnecessary stress. Reciting this mantra will help you take a far more relaxed and simplified approach to your life, which in turn will lead you to feel more accepting and hopeful about whatever comes your way. I give thanks to every cell in my amazing body. How and when to recite this mantra: Recite this mantra three times either out loud or quietly to yourself. As you recite this mantra, visualize your body being in a radiant, healthy, and strong state from head to toe. How this mantra can help you: How often do you stop and thank your body for its hard work? How often do you pay attention to the amazing miracle that is your physical body? Every minute of every day, your body is performing millions of tasks on a cellular level in order to help keep you alive, active, and well. Every second of every day, your body is using its innate intelligence to heal your ailments and alert you when something is not quite right. Your body is intelligent, dedicated, and hardworking—sometimes a little thanks is in order! This mantra is designed to bring healing grace to your body and to thank it for all that it does. Giving thanks for your body helps to raise your energetic vibration, and this in itself can be extremely healing and therapeutic. As you work with this mantra, you may also want to highlight particular areas of your body that you are most thankful for. This can be especially beneficial if you have an illness that is affecting one part or one side of your body. Thanking your body can help you to feel empowered and comforted at a time when it’s difficult to feel in control of what’s happening. It can also help guide your body even further along on the healing process. I release any drama and replace it with peace. How and when to recite this mantra: Recite this mantra three times either out loud or quietly to yourself. How this mantra can help you: This mantra is perfect to use when you feel yourself getting swept away in petty dramas, gossip, and bickering. It is very easy to become caught up in the drama around you. Often we even find ourselves tangled up in drama that is not even ours! Instead of getting sucked into the drama around you, it is much more powerful to find your peace and simplify your life. This mantra will bring you to a place of peace and serenity. It can be hard at times to disengage from the drama around you, but these words can help you do that. They will even allow you to see things from a higher perspective. When you view things from a higher perspective, solutions become more apparent and feelings of stress and anxiety are reduced. This is a simple mantra, but definitely a very powerful one. Things are always working out in my favor. How this mantra can help you: Things always have a way of working out, even if they don’t always go how you expect them to. If you are feeling uncertain or stressed about a decision or upcoming event, chant these words. You will be reminded that no matter what, everything is going to be okay and there are solutions for whatever problems come your way. Reciting these powerful words also helps to reprogram your mind so that you can see the world as a loving, generous place rather than as a place full of corruption and hostility. Choosing to see the world in a positive light can increase your feelings of motivation and joy, which can allow you to live life to the fullest. Even if things don’t appear to be working out in your favor at first, reciting this mantra can help you to see things from different points of view. This then allows you to see the benefits in all situations that come your way. Life rarely goes according to plan, but it does help to know that things are always working out in your favor, as long as you believe that they are. It is safe for me to fall asleep, for I know all is well. How and when to recite this mantra: Recite this mantra three times either out loud or quietly to yourself just before bed. How this mantra can help you: It can be hard to fall asleep when there are unsolved problems, arguments, or situations in your life. Sometimes you can toss and turn all night thinking and thinking and even thinking some more! In order to avoid this, and to get a restful night of sleep, use this mantra to instill the feeling that all is well. Getting a good night of sleep can often help you to see a problem so much more clearly in the morning. Some time, distance, and a restful night of slumber can work wonders, and this mantra is perfect to use whenever overwhelming thoughts are blocking you from relaxing, turning off, and going to sleep. Although your problems might still be there waiting for you in the morning, when you wake up with a fresh mindset and a clear perspective, the answers and solutions you need may just be a whole lot easier to find. Use this mantra whenever you need reassurance before bedtime. The soothing words and the reminder that “all is well” will help you relax so that you can tackle things head-on in the morning. 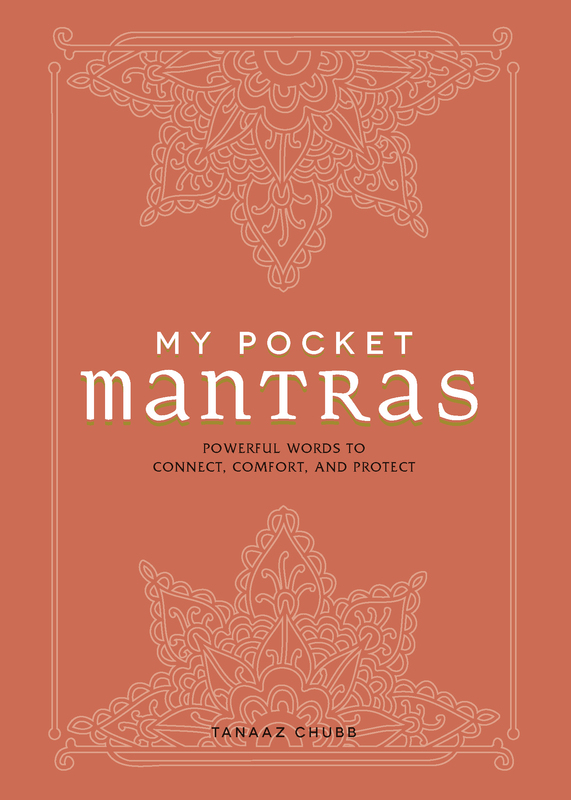 Excerpted from My Pocket Mantras: Powerful Words to Connect, Comfort, and Protect by Tanaaz Chubb, Founder of Forever Conscious Copyright © 2018 Adams Media, a division of Simon and Schuster. Used by permission of the publisher. All rights reserved.